"Marbles" redirects here. For other uses, see Marbles (disambiguation). A marble is a small spherical toy often made from glass, clay, steel, plastic or agate. These balls vary in size. Most commonly, they are about 1 cm (1⁄2 in) in diameter, but they may range from less than 1 mm (1⁄30 in) to over 8 cm (3 in), while some art glass marbles for display purposes are over 30 cm (12 in) wide. Marbles can be used for a variety of games called marbles. They are often collected, both for nostalgia and for their aesthetic colors. In the North of England the objects and the game are called "taws", with larger taws being called bottle washers after the use of a marble in Codd-neck bottles, which were often collected for play. In 1503 the town council of Nuremberg, Germany, limited the playing of marble games to a meadow outside the town. It is unknown where marbles were first manufactured, but the "original" marbles were designated "made in Germany". The game has become popular throughout the US and other countries. [dead link] Ceramic marbles entered inexpensive mass production in the 1870s. A German glassblower invented marble scissors, a device for making marbles, in 1846.:148 The first mass-produced toy marbles (clay) made in the US were made in Akron, Ohio, by S. C. Dyke, in the early 1890s. Some of the first US-produced glass marbles were also made in Akron, by James Harvey Leighton. In 1903, Martin Frederick Christensen—also of Akron, Ohio—made the first machine-made glass marbles on his patented machine. His company, The M. F. Christensen & Son Co., manufactured millions of toy and industrial glass marbles until they ceased operations in 1917. The next US company to enter the glass marble market was Akro Agate. This company was started by Akronites in 1911, but located in Clarksburg, West Virginia. Today, there are only two American-based toy marble manufacturers: Jabo Vitro in Reno, Ohio, and Marble King, in Paden City, West Virginia. In Australia, games were played with marbles of different sizes. The smallest and most common was about 15 mm (5⁄8 in) in diameter. 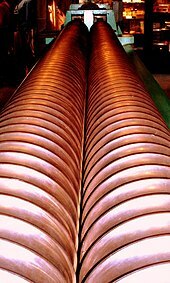 The two larger, more valuable sizes were referred to as semi-bowlers and tom-bowlers, being about 20 mm (3⁄4 in) and 25 mm (1 in) in diameter respectively. They were used in much the same way as ordinary marbles, although sometimes they would be declared invalid because of the advantage of their larger mass and inertia. Owners of large marbles were also afraid to use them lest they be lost to another player as "keepsies". They were usually of the clear "cat's eye" or milk glass type, just bigger. 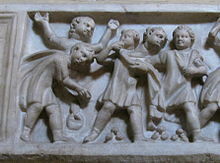 "Firing" a marble meant that a player had to flick his/her marble from a stationary position of his hand. No part of the hand firing the marble was permitted to be in front of the position where the marble had been resting on the ground. Using that hand, (s)he would flick or fire the marble from his/her hand, usually with the knuckle on the back of his/her hand resting on the ground, and usually using the thumb of that hand to do so. All shots of the game were conducted in this manner throughout except the very initial pitch towards the bunny hole that started the game. Once a player was able to land his/her marble within the hole, (s)he would immediately then fire his marble at his opponents' marbles. However, if any player hit another player's marble before his/her own marble had been to 'visit' the bunny hole, the act would be referred to as "a kiss"; the game would be over, and all or both players (in the case of two players only) would have to retreat back to the starting line to restart the game, without result. This, of course, could be quite annoying or frustrating if a player had already built up quite a few hits on another player's marble. So, most skilled players did not resort to this kind of tactic. The overall aim was to hit a particular marble 3 times after getting into the hole, then you had to "run away", before the final contact shot was allowed to be played - which was called "the kill". Once a player made a kill on another marble, if the game was 'for keeps', (s)he would then get to keep the marble [bunny] (s)he had 'killed'. The format of playing this game was that each time you successfully hit another player's marble, you were to have another shot - even if it was not the marble you had originally intended to hit. Of course, the ploy was to hit the particular opponent marble 3 times, and then 'run away' to the bunny hole, because once you rested the marble into the hole, you immediately had your shot again, thus leaving no opportunity at all for your opponent to retreat his/her marble before "the Kill" was made on it. In India, there are many games with marbles. One simple game with marbles is called "Cara" in which every player puts one or more marbles in a long line of marbles with each marble being one centimeter or slightly more, apart from each other. After this, each player throws another marble as far as possible from the line, perpendicularly. In this game, the player whose marble is farthest from the line of marbles gets the first chance to hit the marble's line and subsequent players who get to hit the line have their distance from the line in decreasing order. Any player who hits and displaces a marble in the line of marbles gets to take that and all marbles to the right of it. Usually, marbles in the line are smaller marbles and the players have bigger marbles for hitting the line of smaller marbles.This game needs the playground to be flat and hard and with no loose soil for effecting games of "Cara". The number of players can be anywhere between 2 and 30. The distances of the marbles thrown determine order of players who get to hit the line are anywhere from 10 to 30 meters and may depend on player's desire to hit the marble line first and how much risk they will take so that they would be at some distance and yet be able to hit the line of marbles and get more than 2 marbles. Players have to roll their marbles from a distance to hit the line of marbles. Each player gets to hit the line of marbles only once assuming there are marbles left in the line and every player gets a turn in order. In a line of twenty marbles, its reasonable to get at least 5 to 20 marbles depending on how skillful somebody is at hitting the line of marbles. When all marbles are taken by players as above the game is restarted with players putting their marbles in the line and trying to win as many marbles as possible.If some marbles are left in the line after each player takes a chance, the players again throw their marbles perpendicularly to this line and start to roll their marble to hit the line according to the above rules. This process is repeated until all marbles are taken in the game. 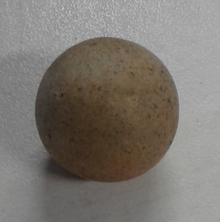 In Uganda, a popular marbles game is called dool. It requires a small pit dug in the ground for two or more players, each with his own marble. To improvise, Ugandans also use the seeds of a candlenut tree, locally referred to as Kabakanjagala (The King loves me). To start a game, a throwing line is drawn on the ground using chalk or a stick about a meter (or some feet) from the pit. Then the players roll their marbles close to the pit. The one whose marble falls in gets points equivalent to one game. If a second marble falls in and hits the first, a player gets more points than the previous player, but all have to return to the throwing line. When no marble falls in, the player whose marble rolls closest to the pit starts the firing session. When he misses, the next opponent fires. You can only fire 24 consecutive times per turn earning one point for each hit. But all that time, a player must make sure the gap between the marbles is bigger than two stretches of the hand. If an opponent realises that it isn't, then he can make a call, pick his marble and place it anywhere. When a player is targeting a marble placed near the hole, he must avoid knocking it into the hole or else give away an advantage. There are various rules for dool but the player with the most points wins. Favoured fingers include the middle finger for blasting strength and small finger for accurate long distance target. The British and World Marbles Championship has been held at Tinsley Green, West Sussex, England, every year since 1932. (Marbles has been played in Tinsley Green and the surrounding area for many centuries: TIME magazine traces its origins to 1588.) 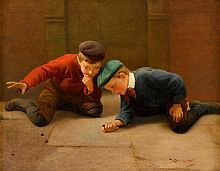 Traditionally, the marbles-playing season started on Ash Wednesday and lasted until midday on Good Friday: playing after that brought bad luck. More than 20 teams from around the world take part in the championship, each Good Friday; German teams have been successful several times since 2000, although local teams from Crawley, Copthorne and other Sussex and Surrey villages often take part as well; the first championship in 1932 was won by Ellen Geary, a young girl from London. As a type of fictional championships on a bigger scale, a team of Dutch Youtubers has been running the MarbleLympics since 2016. This parody of the traditional Olympic Games shows 16 different marble "teams" participating in a diverse set of typical Olympic disciplines, attracting millions of viewers. "Knuckle down": the position adopted at the start line at the beginning of a match. The player begins with his or her knuckle against the ground. "Quitsies": allows any opponent to stop the game without consequence. Players can either have "quitsies" (able to quit) or "no quitsies". "Keepsies" (or "for keeps"): the player keeps all the marbles he or she wins. "Elephant stomps": when called, it allows a player to stomp his or her marble level with the ground surface, making it very difficult for other players to hit. "Bombies": when called, it allows a player to take one or two steps while holding his or her marble and, while closing one eye, will line up over one of the opponent's marbles and drop the marble trying to hit the marble on the ground. "Leaning tops": when called, a shooter leans in on his or her off hand for leverage over an indentation on any type of surface or obstacle. A "taw" or "shooter" is generally a larger marble used to shoot with, and "ducks" are marbles to be shot at. Various names refer to the marbles' size. Any marble larger than the majority may be termed a boulder, bonker, masher, plumper, popper, shooter, thumper, smasher, taw, bumbo, crock, bumboozer, bowler, tonk, tronk, godfather, tom bowler, fourer, giant, dobber, dobbert, hogger, biggie or toebreaker. A marble smaller than the majority is a peawee, peewee or mini. A "grandfather" is the largest marble, the size of a billiards ball or tennis ball. Various names for different marble types (regional playground talk, Leicester, UK): Marleys (marbles), prit (white marble), Kong (large marble), King Kong (larger than a bosser), steely (metal bearing-ball). Names can be combined: e.g. prit-Kong (large white marble). There are many more such names, as discussed in the next section. One mechanical technique is dropping globules of molten glass into a groove made by two interlocking parallel screws. As the screws rotate, the marble travels along them, gradually being shaped into a sphere as it cools. Colour is added to the main batch glass and/or to additional glass streams that are combined with the main stream in a variety of ways. For example, in the "cat's-eye" style, coloured glass veins are injected into a transparent main stream. Applying more expensive coloured glass to the surface of cheaper transparent or white glass is also a common technique. There were a lot of businesses that made marbles in Ohio. One major marble manufacturing company is Marble King, located in Paden City, West Virginia, which was featured in the television shows Made in America, Some Assembly Required and The Colbert Report. Currently, the world's largest manufacturer of playing marbles is Vacor de Mexico. The company makes 90 percent of the world's marbles. Over 12 million are produced daily. Art marbles are high-quality collectible marbles arising out of the art glass movement. 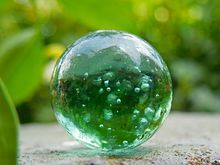 They are sometimes referred to as contemporary glass marbles to differentiate them from collectible antique marbles, and are spherical works of art glass. Collectible contemporary marbles are made mostly in the United States by individual artists such as Keith Baker and Josh Simpson. Art marbles are usually around 50mm marble (a size also known as a "toe breaker"), but can vary, depending on the artist and the print. Marble Blast Gold (2003), a "get to the finish" first person game for the PC and Xbox; a sequel, Marble Blast Ultra (2006), was released later for the Xbox 360. Marble Drop (1997), a computer game wherein players place marbles in a complicated apparatus in an attempt to solve a puzzle. Marble Madness (1984), an Atari game wherein players race each other to the finish line. Oxyd (1991), a game for Amiga, Atari ST, and Macintosh. Switchball (2007), a game for the PC and Xbox 360. The World Ends with You, an action role-playing game that uses a marble-like system called "Tin Pin Slammer" as the basis for several plot events but requires the use of pins instead of marbles. The original Japanese name for this minigame is "Marble Slash". Lose Your Marbles (1997), is a PC puzzle game where players line up marbles of the same color to add marbles to the other player's board and eventually block her/his board. Ker-Plunk, a game for two to four players involving marbles. Marble Silde: also known as Rolling ball sculpture, Marble maze, marble run, marble rail, marble coaster. Used in such things as pinball machines and Rube Goldberg machines. A game of skill, involving building using; rails, tracks, cones, wheels, levers, and ramps. Tock, also known as Tuck, is a cards/board game in which players race their four marbles (or tokens) around the board, with the objective being to be the first to take all of one's marbles "home". ^ Marshall, John, ed. (1931). Mohenjo-Daro and the Indus Civilization: Being an Official Account of Archaeological Excavations Carried out by the Government of India between the Years 1922 and 1927. New Delhi: Asian Educational Services. ^ Joy, Jody; Gunn, Imogen; Harknett, Sarah-Jane; Wilkinson, Eleanor (2016). Hide and Seek: Looking for Children in the Past. Cambridge: Museum of Archaeology and Anthropology, University of Cambridge. ISBN 978-0-947595-23-4. ^ "History of Marbles - Corner Cafe Message Board". Thebabycorner.com. Retrieved 12 November 2017. ^ Abernethy, Francis Edward (12 November 1997). "Texas Toys and Games". University of North Texas Press. Retrieved 12 November 2017 – via Google Books. ^ Baumann, Paul (15 December 2004). "Collecting Antique Marbles: Identification and Price Guide". Krause Publications. Archived from the original on 2017-11-13. Retrieved 12 November 2017 – via Google Books. ^ Acton, Johnny; Adams, Tania; Packer, Matt (2006). Origin of Everyday Things. Barnes and Noble. ^ "e-WV - Marbles". Wvencyclopedia.org. Retrieved 12 November 2017. ^ "Young Ugandan Journalist". Cultural Reflections. Archived from the original on 2014-10-06. ^ a b c d "Losing your Marbles". BBC Inside Out programme. BBC. 9 June 2003. Retrieved 13 January 2010. ^ a b Collins 2007, p. 88. ^ Aitch, Iain (4 April 2009). "Event preview: British And World Marbles Championship, Tinsley Green". The Guardian. London: Guardian News and Media Ltd. Retrieved 13 January 2010. ^ a b Sandy, Matt (7 April 2007). "Village rolls out a welcome for World Marbles Championships". The Times. London: Times Newspapers Ltd. Retrieved 13 January 2010. ^ a b "Sport: At Tinsley Green". TIME magazine. TIME Inc. 17 April 1939. Retrieved 13 January 2010. ^ Pearson, Harry (26 April 2003). "Going under in the marble halls of Tinsley Green". The Guardian. London: Guardian News and Media Ltd. Retrieved 13 January 2010. ^ Gwynne 1990, p. 172. ^ Dackevych, Alex. "The marble racing craze that's captivated the internet", BBC News, United Kingdom, 15 April 2016. Retrieved on 8 April 2019. ^ BondeNews Editors. "Youtube channel promotes marbles 'olympiad', BondeNews, Netherlands, 24 July 2017. Retrieved on 8 April 2019. ^ Media, Cider Press. "Kinds of Marbles - Antique, Vintage and Collectable Marbles". Imarbles.com. Retrieved 12 November 2017. ^ Jenkins, Tiffany (25 February 2016). "Keeping Their Marbles: How the Treasures of the Past Ended Up in Museums - And Why They Should Stay There". Oxford University Press. Retrieved 12 November 2017 – via Google Books. ^ "Agates, Corkscrews, and Onionskins: Fun with Antique Marbles". Collectorsweekly.com. Retrieved 12 November 2017. ^ "A Brief History of the Birth of the Modern American Toy Industry". Americantoymarbles.com. Retrieved 2009-01-21. Baumann, Paul. Collecting Antique Marbles (4th ed.). Wikimedia Commons has media related to Marbles. Associated Press, Toby Sterling (January 4, 2014). "Marbles that belonged to Anne Frank rediscovered". Yahoo! News.